Dubai: Dubai 360, the world’s largest interactive city tour, was officially launched yesterday at midnight. Being the first of its kind, the site allows viewers to explore every angle of the city from the comfort of their own home using fully interactive and immersive 360 degree panoramic photo, time lapse and video content. With content filmed at the pinnacle of the world’s tallest building, Burj Khalifa, the site users can get a bird’s eye view of the city with sweeping panoramas down Shaikh Zayed Road and Dubai’s coast. From there at the click of a button, viewers can travel to the luxurious Royal Suite at the Burj Al Arab Hotel and experience the gold-covered interiors, luxurious rooms and stunning sea view. A visit to Dubai Mall’s famous aquarium will allow users to swim amongst the sea creatures, or take a ride on Dubai’s Metro and view the city at speed. Gulf News talked to Esmail Al Hashemi, Project Manager for Dubai 360, who pointed out that the project was completed under a team of 30 designers, photographers, and IT and graphic experts over a period of 18 months. Using the latest visual technology, the project was created by professionals equipped with best-in-class medium format, DSLR and video cameras. 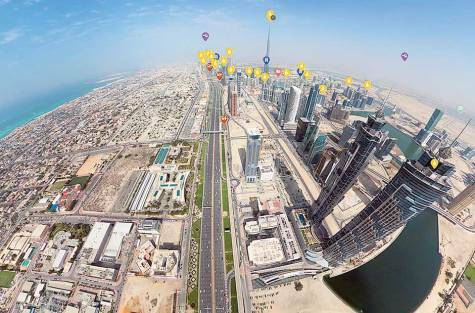 From helicopters to rooftops, the making of Dubai 360 provided the team with first-time access to some of the city’s landmarks. 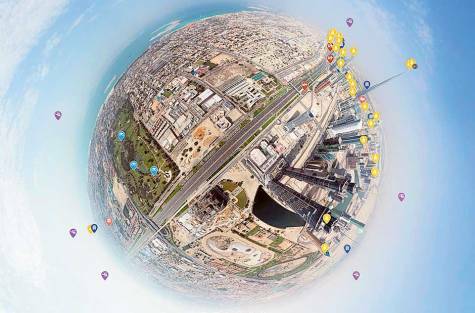 The Dubai 360 team also developed a custom interface for the website, which enables viewers to interact with Dubai’s landmarks providing a number of viewing options including rectilinear and ‘Little Planet or fish eye’ view. People can also share their favourite views with their friends through social media channels like Facebook, Twitter, Google Plus and email. The site uses 1,298 pieces of panoramic video and photo content, giving viewers exclusive views of the city. Al Hashemi explained that while a very few countries enjoy a similar but simpler technology, their websites only cover a maximum of 30 locations. Dubai 360 has over 1,000 frames and different locations, and there are plans to continue updating the site to demonstrate the progress of the city, he said. The website is currently operating in English. However, plans to provide users with the option of viewing the site in Arabic are under way. “With Dubai360.com, whether you live in Dubai or are planning a visit, you can discover something new in the city every day,” he said.